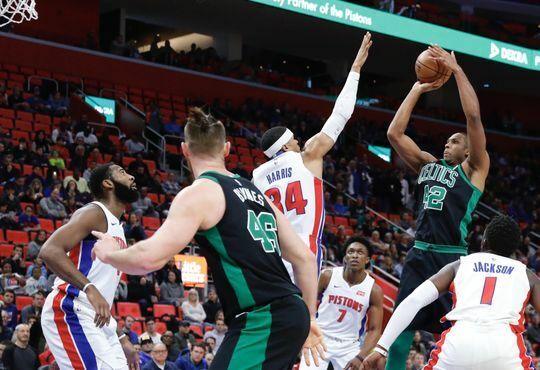 The Boston Celtics defense reigned supreme in a rematch with the Detroit Pistons, avenging a loss from the last time they met, 91-81. After dominating the C's last time around Andre Drummond was held in check on the offensive end, totaling only 6 points compared to the 26 he had last time around, but he still got his on the glass with 15 rebounds. Tobais Harris led the Pistons with 19 points and 8 rebounds. For the Celtics, Al Horford led the offense with 18 points, 9 rebounds, and 6 assists. Kyrie Irving tallied 16 points and Aron Baynes was a monster both in his defense of Drummond and rebounding the basketball as he led the C's with 13 boards. After a lackluster performance against the Spurs on Friday night, Al Horford looked to assert himself early in this one, scoring 8 points in the opening frame; however, knee-to-knee contact with Anthony Tolliver sent Horford to the C's locker room for examination with just under 5 minutes to go in the 1st. The Celtics looked to negate Avery Bradley's all-world on-ball defense from the get go as they tried to run early in the first quarter, attempting to not allow the Pistons defense to get set. Although the Pistons started strong the Celtics ripped off a 13-0 run to take the lead midway through the 1st. And yet despite the offensive woes, they maintained a 7-point lead (44-37) heading into the half behind some stellar defense. The C's held the Pistons to 31.8% shooting in the 1st half, managing to keep big man Andre Drummond in check as they held him to just 5 rebounds and 0 points. Aron Baynes did the bulk of the work keeping Drummond under wraps. Our old pal Avery led the Pistons with 12 points at the break, and mask-off Kyrie Irving paced the C's with 11 points on 3 of 5 shooting (2 of 2 from three). The Celtics offense came around to start the 3rd, as they rattled off a 16-5 run to start the 2nd half. Horford returned after his knee scare, knocking down back to back buckets to add to his scoring total. The C's doubled their lead in the 3rd quarter, heading into the final frame up 14 (73-59). The Pistons made it a game to start the 4th, after a 12-0 run cut the Celtics lead to just 4 (79-75) with 4:22 to play. The C's managed to regain their composure down the stretch and finish off the Pistons for their 23rd win on the season.